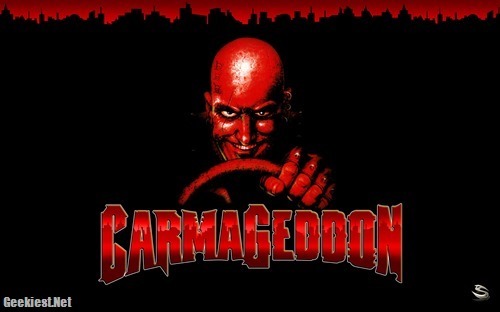 Carmageddon one of the famous game from Stainless Games changed the pricing on Android Play store from $1.99 to Free. The game was earlier available for FREE like just one day promotions, now it is completely free and of course now coming with Advertisements. The game now features our own ad system, that runs once on Startup. Stainless do not and will not ever receive any income from the ad system. 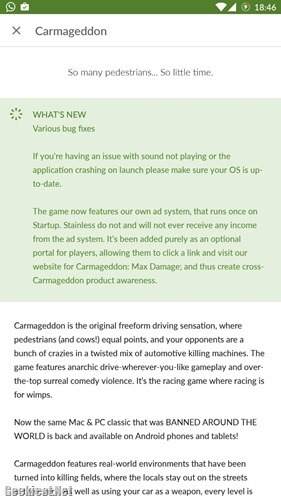 It's been added purely as an optional portal for players, allowing them to click a link and visit our website for Carmageddon: Max Damage; and thus create cross-Carmageddon product awareness. If you're having an issue with sound not playing or the application crashing on launch please make sure your OS is up-to-date. I was able to install the game and play it with out any issues. The game is inspired by the 1975 movie Death Race 2000.The first version of the game released in 1997 for PCs. From 2012 onwards the game is available on the iOS and Android platforms too. The game is banned in many countries due to the violence involved in it. In this game you need to kill as much as pedestrians to earn points. Your opponents are other crazy drivers like you, you need to destroy their cars as well. Get Carmageddon Racing game for free from Play Store.